Like I said in my last update, I fancied getting out for a nice long run this weekend, and this morning I made good on that. I ran from home, out along the towpath under the Suspension Bridge, all the way to the far entrance to Leigh Woods, then up into the forest. 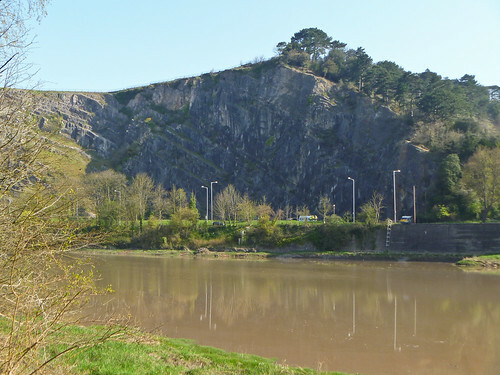 I did a fairly big loop of the forest, then came out to head back across the Suspension Bridge into Clifton, then all the way around Clifton Down and Durdham Down, and back to Clifton Village. All told, it was just over 15km, although I lost GPS signal for the last kilometre and a bit, so I can’t be certain. I manually fixed the route in RunKeeper, and it came out at 15.59km, which can’t be far out. I also took out two new things: First, The Indelicates’ new album, Songs for Swinging Lovers, available right now for download — for the price of your choice, including “free” — from the Corporate Records website. Second, my shiny new Panasonic Lumix DMC‐FP3 camera. So, I took a load of photos, too 🙂 They’re all here in this set on Flickr, but there were two I particularly wanted to post here, because they say quite a lot about my route. 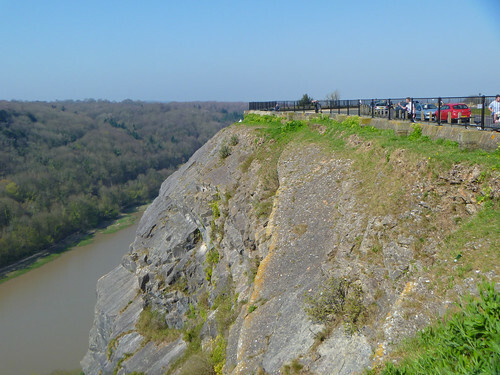 They’re both photos of the same place, the “Sea Wall” railings at the top of the Avon Gorge, at the edge of Clifton Down. So, yeah, think that gives some idea of the vertical height involved in my jog today, as well as the overall distance! I reckon I can declare myself ready for the Bristol 10K. And it’s nice to have done roughly three quarters of a half‐marathon, too 🙂 I don’t, on the whole, feel too bad, although I’m not entirely convinced I’ll be able to move tomorrow! I might give myself a few days off and not do a mid‐week run until Thursday, this week. I think I deserve it!